Oliver König, aka Butterkneter, is one of Germany's top modders. We've seen his work before on the pages of bit-tech, and it's always blown us away. You can check out his modding resume in one of the last articles that Olly featured in, where we looked at his Battlefield 2 mods. The spectacular BF2 mods that Olly knocked out for EA were enough to entice the gaming giant to come back to him for a promotional rig as the World Cup approached. 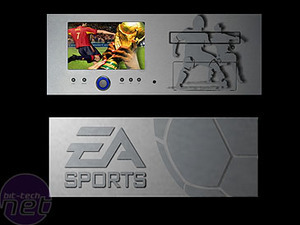 With footie fever gripping Germany, why not come up with a case mod that appeals to the football fan inside many geeks, whilst also promoting EA's exclusive football game license? It was a job that was too good to pass up, so our man with the mods put on his designing hat. 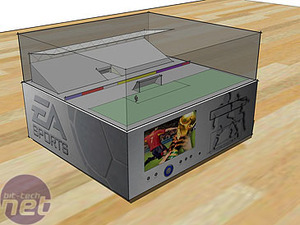 EA wanted to use the case as a prize for an online FIFA tournament for the Xbox, so the mod not only had to be good, it had to be rather robust, too. "Because I had already built the Battlefield 2 PCs for EA, and because those guys seemed very happy with what I'd done previously, I got a mail from them asking whether I would be interested in building a football mod. Obviously, I accepted the challenge, and started planning out what to do." 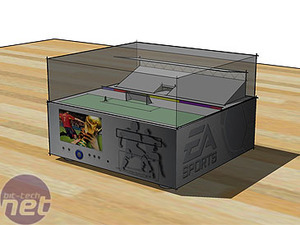 "Because football games are often played on a large TV in the living room, I had the idea for a HTPC case. I choose the Origen x15e case, which has a built-in touchscreen. " 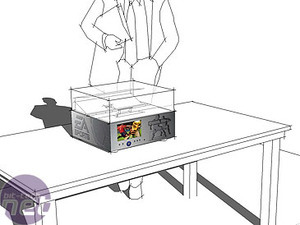 "In order to get a connection to football, I decided to install model of a football stadium in a plexiglass box on top of the case." A neat, if deliciously simple idea. Any modder knows that the way to success is to plan, plan, plan - so that is just what Olly did. "First I made some scetches in Sketchup. On the basis of these sketches, I produced some CAD files so that I could get some aluminium sheets laser cut with the football design that I wanted." Just in time for the summer heat, our friend Butterkneter is back with another awesome FIFA themed mod. Game sequels may be a bit drab, but the mod sure isn't! Top German modder Butterketer, aka Olly Konig, teams up with Heiko Rupp to produce a mod for EA to promote Battlefield 2142. We cover the construction process these case modding masters followed.